Today I have my most dreaded doctor’s appointment. It happens twice a year and I go kicking and screaming every single time. I don’t really know why. I usually have great check ups and never have problems but I just hate having someone dig in my mouth. It gives me the heebie jeebies. Ick. Ick. Ick. And why is that the hygienist always wants to talk? I mean I know it she is just trying to be friendly but it’s awkward because I can’t answer back with her all her tools in my mouth and I don’t really want to answer because I just want her to do her job and be finished. I don’t want it to take any longer than necessary. And today I have x-rays. Another bright spot in the appointment. I like nothing more than having hard film pieces being awkwardly shoved in my mouth while sitting under a 20 pound radiation protective vest. I am a peach today, no? Obviously I really hate the dentist. Oh another note. I do have a recipe for you. For years I would simply eat my vegetables plain because I didn’t really know what to do with them. I still am usually pretty simple; you know olive oil, fresh lemon, salt and pepper. But every so often I go all out. 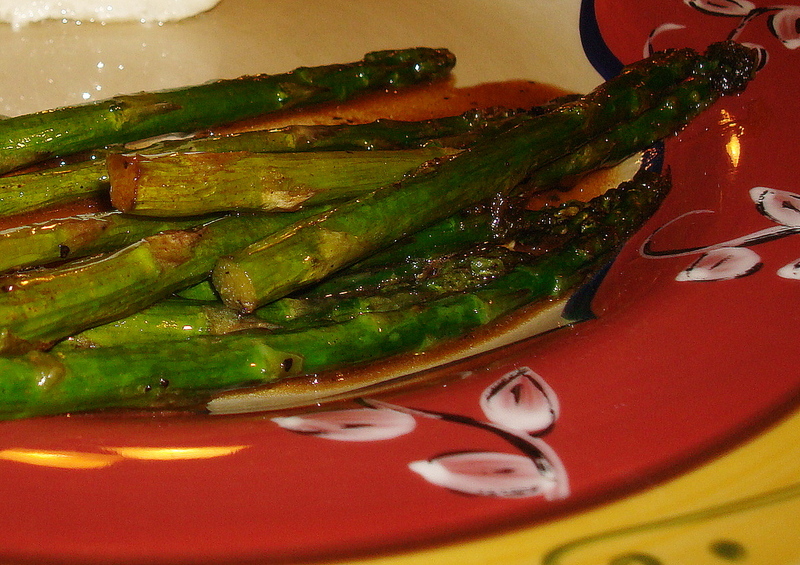 Preheat the oven to 400 degrees and arrange the asparagus on a cookie sheet lightly sprayed with nonstick spray. Sprinkle with salt and pepper. Bake for 12 minutes, or until tender. Melt the butter in a small saucepan over medium heat. Remove from heat and add soy sauce and balsamic vinegar. Pour over asparagus, tossing to coat, and serve immediately. Do you like the dentist? What about your vegetables…do you eat them plain or dressed up? Ugh– I hate the dentist too. Good luck! oh girl that’s nothing. 2011 was the year I went to the dentist every month and sometimes twice! i’m part of their family now, they even sent me a Thanksgiving card now, which is probably only for most valued customers! no matter how OCD I am with taking care of my teeth, genetically I have been given the gift of soft teeth prone to a lot of problems, my whole family has these issues. Good luck today! and keep in mind, it could always be worse! I actually like going to the dentist. I love the feeling of getting my teeth cleaned. However, I have TMJ and I have to make two appointments (one to have my top and one to have my bottom cleaned) because having my mouth open long enough to do both affects my jaw. I barely have time to squeeze in one appt, let alone two, so it’s really irritating. I don’t mind the dentist at all. But, I wasn’t always this way. I used to hate the dentist – dreaded and avoided it when I could. But, I’ve had so much work done now that it doesn’t bug me one bit. The last time I went to the dentist it was one of the worst experiences of my life. My gums hurt for hours after. I hope yours goes much better. Is it weird that I like the dentist? I think it’s relaxing to lay there in that chair not having to talk to anyone. Plus, at my dentist, you get a hot wax treatment on your hands when you are lying there. It’s quite luxurious. Also, balsamic butter? I must try. Dentist = not pleasant. But, I go dutifully twice a year. I’ve been making that recipe for years – did you get it from cooking light? It’s my husband’s favorite side dish. I have no idea where that recipe is from. I found it on a sticky note? Woof, I hate the dentist. Last time I went I had 4 cavities! I haven’t had that many since I was like 10 and lied about brushing my teeth. Stupid old age. And whatever you do, never let them talk you into not using Novocaine. NEVER. bahahaha… I seriously hate the dentist. I always get judgemental looks for not flossing enough. Always. hehe, i think i am the only one that likes the dentist. I know, i am crazy. But thats because growing up my dentist was HOT! major crush! Recipe looks awesome friend. I love asparagus.